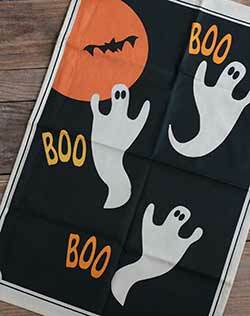 Halloween themed linens by The Weed Patch, including dishtowels, napkins, runners, pillows, and more by Tag, Design Design, India Home Fashions, Park Designs, Raghu, and other great companies! 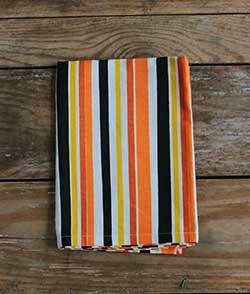 This is for the striped dishtowel, with orange, yellow and black stripes against a white background. 100% cotton. Ghosts and BOO printed on a black background with off-white border. 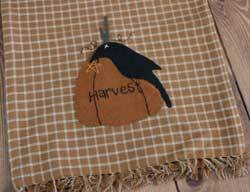 Bright orange guest-sized dishtowel with an embroidered silhouette image and black rick rack trim. 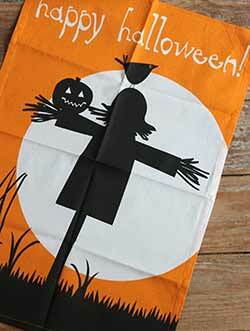 A set of three cheerfully colored flour sack towels, 100% cotton, machine washable. 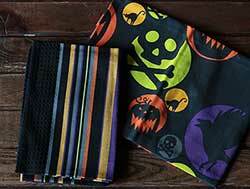 Printed in a grid design with a variety fall critters. 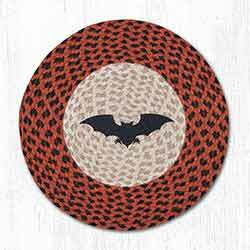 100% cotton, machine washable. 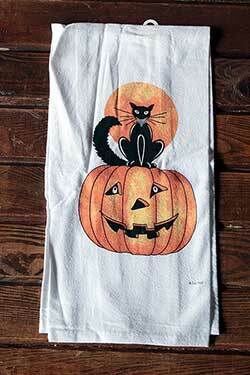 Halloween Night Vintage Dishtowel, by Tag. 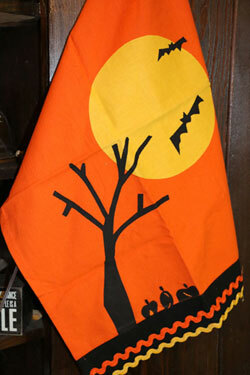 This fantastic orange towel features an appliqued scene of a full moon, bats, and tree silhouette! Features ric rac border. 100% cotton. Machine washable, see label for care instructions. 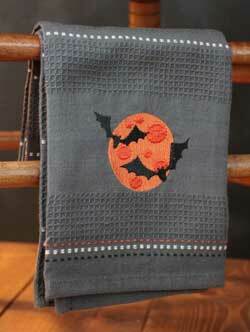 Happy Hallow Moon Towel, by Raghu. 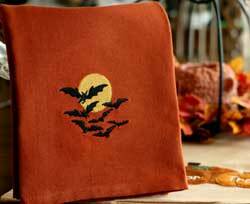 This orange colored towel features appliqued bats and full moon. Measures 18 x 28 inches. 100% cotton. Machine washable (see label for care instructions). 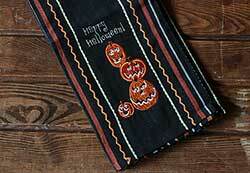 Happy Halloween Table Runner, by Raghu. 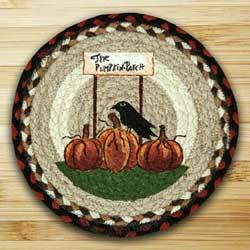 This nutmeg-brown-colored table runner is made of cotton, and features cross-stitch embroidery that reads: Happy Halloween. Measures 14 x 36 inches. 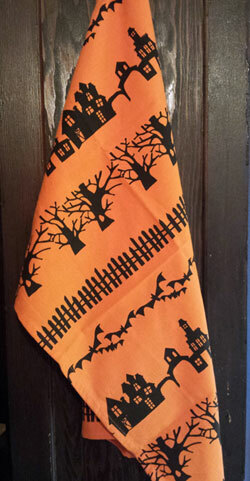 Orange cotton dishtowel printed with silhouettes of trees, haunted houses, and fences! Measures 18 x 26 inches. 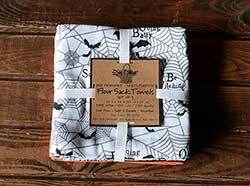 Jack & Friend Flour Sack Towel, by Kay Dee Designs. 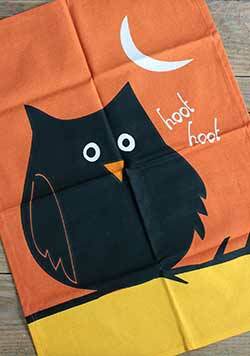 Printed 100% cotton flour sack towel. Measures 26 x 26 inches. 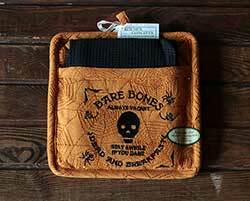 Mr. Skeleton Tea Towel, by Primitives by Kathy. 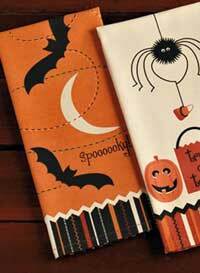 Add charm to any kitchen with these tough tea towels. 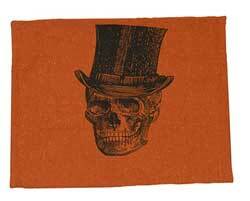 This one is orange, and features a printed image of a vintage-style skeleton with a top hat. Measures 24 x 15 inches. 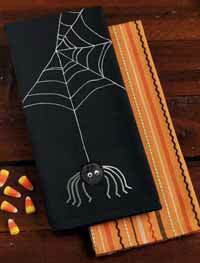 An Annie Schickel design. 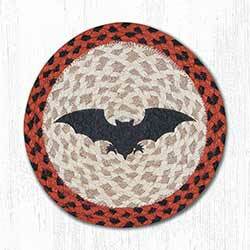 Made of a rough, sturdy, woven cotton fabric. 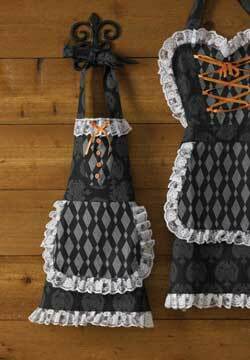 Mrs. Skeleton Tea Towel, by Primitives by Kathy. 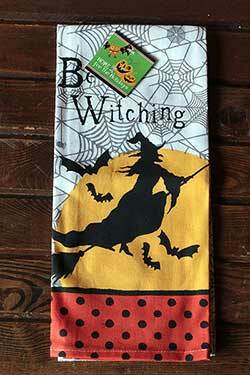 Add charm to any kitchen with these tough tea towels. 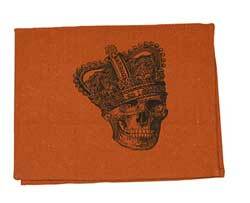 This one is orange, and features a printed image of a vintage-style skeleton wearing a crown. Measures 24 x 15 inches. 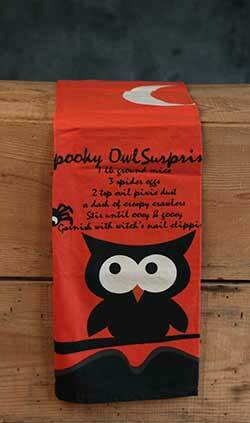 An Annie Schickel design. 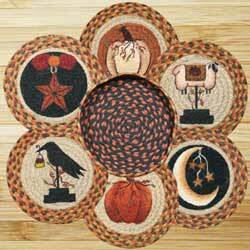 Made of a rough, sturdy, woven cotton fabric. 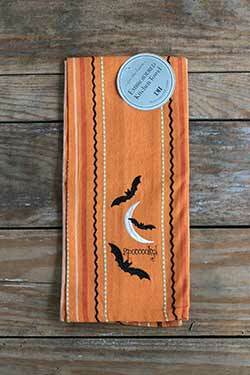 This printed dishtowel features a scarecrow silhouette against a full moon and vivid orange sky. 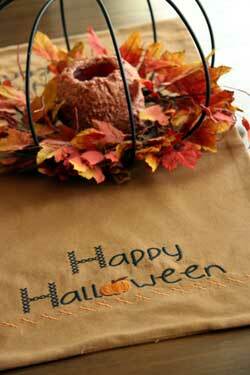 Reads: Happy Halloween. 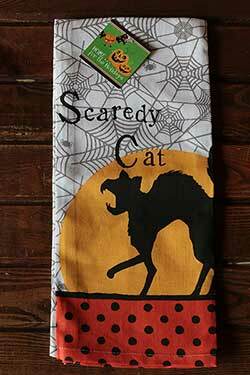 Scaredy Cat Tea Towel, by Kay Dee Designs. 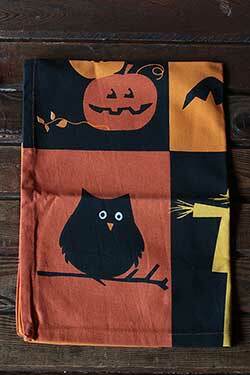 Printed 100% cotton tea towel. Measures 18 x 28 inches. 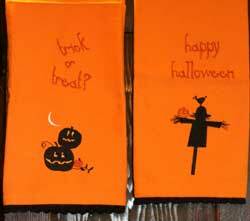 Trick or Treat Towel, by Raghu. 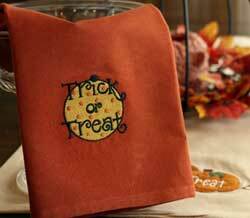 This orange colored towel features appliqued moon and Trick or Treat message. Measures 18 x 28 inches. 100% cotton. Machine washable (see label for care instructions). 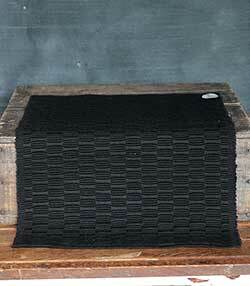 Jet black cotton with an attractive stitched ribbing design. Measures 13 x 19 inches.